George HatfieldWe are very fortunate and pleased to welcome George Hatfield as our speaker this month. George will be speaking on ‘Pendulous Cymbidiums’, a topic that he is eminently qualified to address as he has produced some of the best pendulous cymbidiums in the country. George is currently the President of the American Orchid Society and the owner of Hatfield Orchids, a Ventura County, CA based company, initiated in 2005 and focused on the development of high quality and award winning cymbidiums. Some of George’s beautiful cymbidiums can be viewed on his facebook page. George also will be providing the plant table this month. George’s visit is being co-sponsored by POS and SDCOS. Accordingly, he will be speaking on Tuesday, April 4 to SDCOS on ‘Cymbidium Species’ in Balboa Park and all are welcome to attend. Please see the SDCOS website for details on time and location. 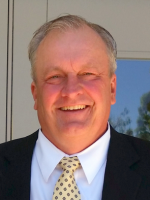 George Hatfield holds a Bachelor of Science in Plant and Soil Science from California State Polytechnic University. He is a well-known speaker who is active in the Cymbidium Society of America and the American Orchid Society, as well as several Southern California regional orchid organizations. George is an orchid judge for both the CSA and AOS, and is currently the Chairman of the Santa Barbara judging region for the CSA. George is also a past-president of the CSA and was the Chairman of the CSA Cymbidium Congress from 1998-2001 and president of the Santa Barbara International Orchid Show in 2002 & 2003.